Thinking about adding a hard top to your Jeep Wrangler? Our 1990 Jeep Wrangler (our pride & joy before we got the ’04 Unlimited), was the only Wrangler we’ve ever had a hard top for. We used the hard top in the winter and a bikini top in the summer. Ours was the 1-piece fiberglass hard top. It served its purpose well — especially in those cold, winter months. The only downside… it made the Jeep feel a tad clunkier — pretty much like a brick on wheels. Just the same, the ride was quieter (better insulated, so less road noise). We were sheltered from the elements. And the interior of our Jeep was protected from rain, leaves, and fading from the sun. Plus, the hard top made it possible for us to lock our Jeep — so I felt safer taking my camera places, because I knew I could lock it in the Jeep if we went into a restaurant or something. Without the hard top in place, we would not have been able to drive our Jeep during the colder months, because we didn’t have a soft top for that Jeep. 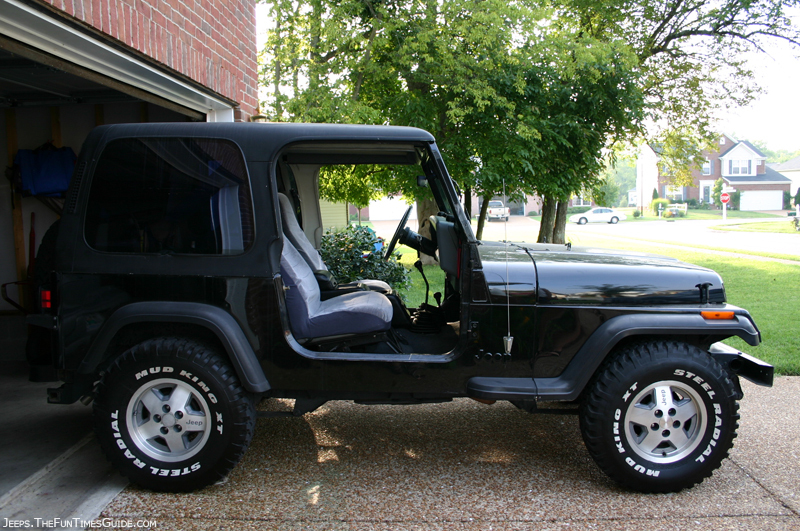 See more Jeep hard tops from 4 Wheel Parts. Need a Jeep hard top storage cart (on wheels) to hold your 1-piece hardtop and roll it out of the way in your garage?